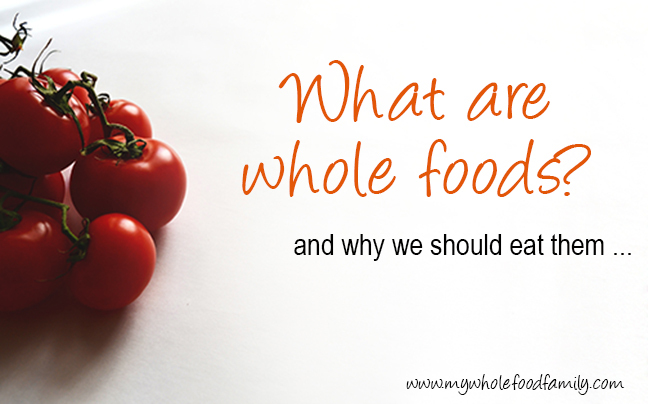 My Wholefood Family Essentials: What are whole foods and why eat them? Not too many years ago we were a typical household, spending a fortune at the supermarket every week and coming home with piles of packets, jars and cans. The pantry never seemed big enough to hold all the packaged food and if I'm honest, I liked seeing the pantry full - it gave me a sense of security. Fast forward to when our first child was ready to start solids and I had no idea what I should be feeding him. The advice was to start with processed rice cereal but that never sat quite right with me. Surely just plain fruit or vegetables would be better? We then discovered quite quickly that he was intolerant to wheat and dairy and did an overhaul of the ingredients we bought for him, even if not so much for ourselves. How important is our diet to our overall health? It was only when we were trying for our third baby and suffered two devastating miscarriages along the way that we really began to look at what we were eating. We wanted to be as healthy as possible and it didn't take too much research to tell us that diet has a massive impact on physical and mental health. The turning point for me was finding Sarah Wilson's I Quit Sugar and reading Sweet Poison by David Gillespie. I realised we had fallen into the trap of pseudo-healthy processed foods - high sugar, high carb, low fat filler foods with very little nutritional value. All the veggies in the world weren't going to balance that out! We had to do a major overhaul and start fresh. It was time to eat cleanly. Clean eating is all about refreshing your eating habits and really getting back to basics. Embracing fresh, whole foods and choosing the most natural and healthy option from all the food groups. The term whole foods refers to foods that are are as close to their natural state as possible with minimal or no processing or additives. They are clean foods that retain their nutrients and nourish the body. As an example a tomato is a wholefood - tinned tomato soup is not! As I've explained before, eating this way has been a journey of discovery for us and not something that happened overnight. We are now at the point where I make nearly everything from scratch including bread, but this has been a long time coming. A wholefoods diet is not restrictive at all and in fact, no food is off limits. Want potato chips? No problem, just make them yourself with fresh potatoes and a good quality fat (these garlic fries were amazing). Want chocolate cake? Choose a recipe with spelt flour, nuts, 85% cocoa chocolate, butter, eggs and free from refined sugar (check out my Chocolate Orange Celebration Cake). It is amazing how satisfying these foods are when made from scratch with quality ingredients. And it makes it much easier to stop at just one piece! Does it have to be organic to be healthy? Something I get asked a lot is whether we eat organic and the answer is, no. Well not completely anyway. Budget-wise eating 100% organic is simply not possible for us. There is no doubt that organic is better for you and if money were no object we would absolutely choose organic. However, organic is not the defining factor when it comes to whole foods. A carrot is a healthy and delicious whole food whether it is organic or not so don't let that stop you! And speaking of fruits and vegetables, you may have heard of the Clean 15 and Dirty Dozen put out by the US Environmental Working Group. These are a great guide as to whether it is worth buying organic. Using a guide like this is a way to stretch your food budget further by only buying the organic food that is really worth it. I have created a free printable of the Dirty Dozen and Clean 15 for you which are now in my resource library. Want access? Subscribe here for free instant access to all the materials in the resource library, with new content being added all the time! Next week we'll be talking about how to set up your wholefoods kitchen including taking inventories of pantry, fridge and freezer so you're not throwing money away. If you like this post you can also sign up to get new posts delivered straight to your inbox.